Our engineering team works very hard to make the Carton Sealer Auto Packing Line highly durable, and instill the features of 16 m per min Speed with strapping belt, 9 to 15 mm Width and 0.5 to 11 mm Thickness. 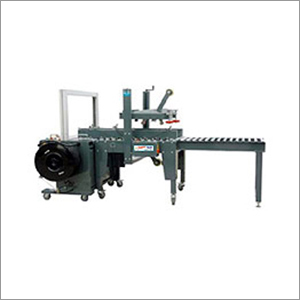 The line may include carton erector, packer, sealer; strapping machine and carton palletizer to perform multiple operations in one go. We design these machines specifically for packing the bottles into the cartons, automatically. The innovative technology used at our manufacturing unit helps us to enhance the efficiency of Carton Sealer Auto Packing Line in accordance with latest quality standards. Further, we have installed a streamlined functional mechanism that enables us to process orders in less turn-around time. Moreover, we have a team of qualified and proficient team of professionals to handle all the machines effectively. The entire product is duly checked for several physical and performance characteristics such as dimensional accuracy, configuration, and operational efficiency.